Well I did it. A feat once thought unattainable, now can be seen and touched by the cynics and the dreamers. The speed of science is now in pace with the beat of the human heart and this is an exciting time. A time where the convergence of cultures mix without volatile conflict, a time where change is a positive. The journey was longer than I thought it would be. The path needed to be made by a trailblazer. As my footprints chronicled the journey, the world followed in anticipation. My legacy will exist beyond the dirt. A thousand mountain switchbacks lay in front of me, to my back, the progress. Along the way I had a great deal of help. I'd like to thank my local livestock farmer, the apathetic police and the clueless fools that never thought to pursue the solution. The genetics of two opposite polar minds. The culture of crime defined, now infiltrated by good people hoping to not be needed in the future. A prayer for obsoleteness, a prayer for peace. The culmination of lives well lived and tranquility the reward. The plague of gang violence in our fair cities will be no more. The CRIP/BLOOD hybrid is born. Created by science in hopes of preventing the violence. He could be our most powerful weapon to fight crime from the inside. Pressing through the cell wall of the social clicks and into the nucleus of the problem. 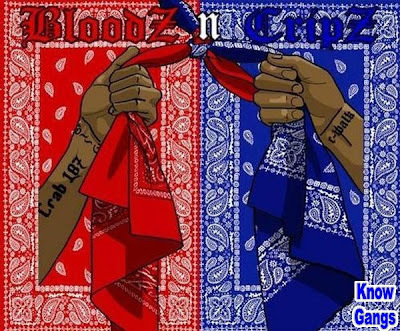 We took blood from a BLOOD and a CRIP to fuse their DNA as one. 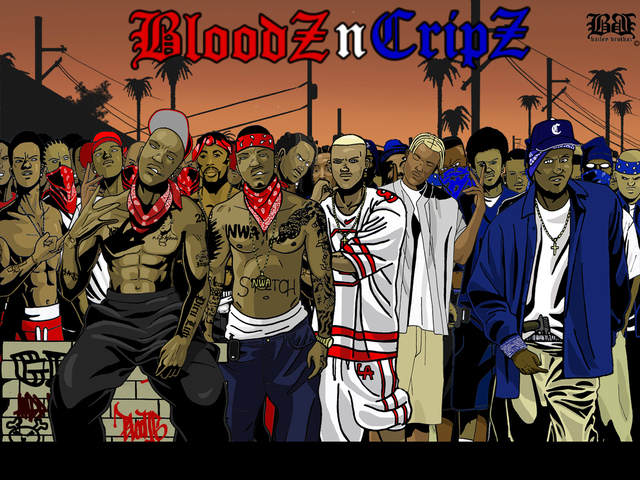 It was easy gathering the gang member DNA, "they blood is already on da street. Truth." After splicing the BLOOD/CRIP DNA, we were left with a man named Gary. He was our gamble on life and ethics. Our bold mission is to unite the world between the playas and the haterz. Sadly, things haven’t gone well in this noble attempt at curbing urban crime. Good intentions and results often find themselves at a crossroads. Every now and then, results shakes hands with good intentions and they agree to see other people. Gary ended up being a chatty, effeminate dude in a purple tracksuit. We knew red and blue made purple, but we never saw this coming. Possible infiltration into certain circles is uncertain. He’s made a splash on the club scene, but has not returned any info on gang activity. He has managed to amass a very impressive collection of shoes and dating a man named Domm. They are planning to buy a tea-cup poodle together. So I guess, at least Gary’s assimilation into society was a success. All that stuff I was saying in the beginning disregard. Starting ,effective immediately, my exit from genetic tampering begins. I've got a bathtub of lamb afterbirth I’m just going to throw away. So come by if you want it for some reason. I won’t judge. I just figure since it’s sort of hard to find there’s got to be someone that might want it. Gary just sort of birthed himself and left without cleaning up his cocoon juice. Who knew genetics would be such a challenge. But know this, I will stay dedicated to preventing blood shed over people's favorite colors, lowering the number of chicken-heads and I will do my best to ensure "represent'in" never exceeds regulation. East Coast/West Coast same Erf, Blue/Red just a shirt, we all the human race and they be no finish. Improper grammar...word and truth. Really, real talk and what not. If you run into Gary tell him I'd like to talk to him about some missing prescription drugs that were prescribed to me after a dental procedure that seem to be missing. I'm not mad, I'd just like him to remove my personal information from the bottle before he trades it for Ecstasy.